A grease trap or interceptor is a plumbing device that collects grease and prevents it from going down your drain. This device must be installed by a licensed plumber and requires regular maintenance to operate effectively. Most communities have a Sewer By-Law that requires all commercial, institutional and food service preparation operations have a grease trap installed. It protects your sewer and saves you money. Fat, oil and grease hardens as it cools and sticks to the inner lining of sewer pipes, eventually causing a blockage. How Does a Grease Trap Work? Wastewater enters the grease trap from your sinks and dishwashers. The water cools and the grease and oil harden and float to the top of the trap. The rest of the wastewater flows through the trap and out the exit pipe to the sewer. The grease, oil and fat remain in the trap. What is the Difference between a Grease Trap and a Grease Interceptor? They both do the same thing – collect grease and prevent it from going through your private sewer service pipe into the sewer. They differ only in size and location. 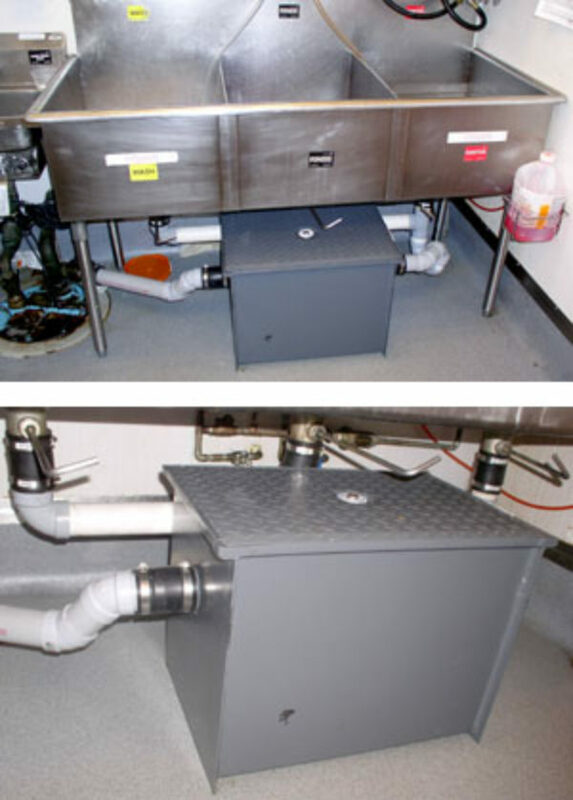 Grease traps are fitted to the plumbing inside a facility, usually under the sink, and grease interceptors are outside the facility a few feet under the ground and are very large. How Do I choose between a Grease Trap or a Grease Interceptor? A licensed plumber can determine which of these devices is best suited for your facility. They will consider the volume and flow rate of wastewater from your sinks, dishwashers and mop sinks to determine proper sizing. Does a Grease Trap Prevent Blockages? Blockages will occur if the trap is not cleaned often enough. A grease trap which is not cleaned will eventually clog. Will a Food Waste Grinder Affect my Grease Trap? Yes. The ground up solids from food waste grinders (or garburators) settle to the bottom of the trap and take up room. The trap will clog up with grease more quickly and will need to be cleaned more frequently. Yes. Under the Sewer By-law, an owner could pay penalties based on the number of offences. In addition, the community can take remedial action at the owner’s expense. Why Does my Grease Trap Back-up and Overflow? Grease traps back up either because they need to be cleaned or because an outlet is blocked. If you buy a large unit you will need to clean it less often because it will hold more grease. But all grease traps will clog if you don’t remove grease regularly. How Often Should I Clean my Grease Trap? Clean under-the-sink grease traps weekly. If grease traps are more than 50% full when cleaned weekly, then clean them more frequently. What if my Kitchen doesn't Generate any Grease and I don't Use Grease in my Cooking? What Can I Do to Reduce the Amount of Grease & Oil Going to my Trap? Use dry paper towels or a spatula to wipe all grease and food waste from cookware into the garbage before washing in the sink or dishwasher. Use strainers in your sinks to catch food waste. Empty the strainer into the garbage. Put greasy foods in the garbage, not down the drain or in the food waste grinder. Pour small amounts of cooking oil and grease into a container with a tightly sealed lid (e.g., coffee can, small ice cream pail) and once it hardens, put it out for regular garbage collection. Do not pour it down the drain. Do I Need to Keep a Maintenance Log Book? Yes. The maintenance log is a record of how often you clean the trap and how full it is each time. It is required under the Sewer By-law to ensure that maintenance is performed regularly. The by-law also requires that the maintenance records for the previous 12 months be available for inspection. Can I Recycle Cooking Oil? Yes. Some businesses collect and reuse large amounts of cooking oil. You can request a conditional waiver if there is no cooking or cleanup on site. Your local authority will review your operation to determine if a waiver is appropriate.